We love Chacras de Coria. This is where our children were born and raised. This land is where we lived through our dreams and misfortunes. This is the place where we imagine our futures. Here is where "Lares de Chacras" started. We are the Day family, a family with history in this area that on a fine spring day, two years ago, we started dreaming about a family project. A new path to cross together. 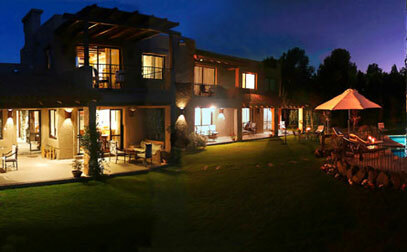 This country style house reflects the art of combining Andean stone with typical desert wood, bringing out a natural, simple and modern look.The natural environment is seen through all windows and doors, a typical view for Chacras de Coria, the galleries, the park, swimming pool and hot tub, solarium and a "quincho", a covered area very common for barbecues and special clay ovens, always available for guests who love out-door life.